In January, the bill “An Act Relative to Gender-Based Discrimination and Hate Crimes” was re-filed in the Massachusetts House and Senate. It would finally add “gender identity or expression” to the state’s discrimination and hate crimes laws and give transgender and gender non-conforming people basic civil rights. On January 21st, the Interfaith Coalition for Transgender Equality (ICTE) and Keshet held the event “AN ACT OF FAITH: Massachusetts Communities of Faith Speak Out for Transgender Equality” – officially beginning the faith-based campaign in support of the bill. 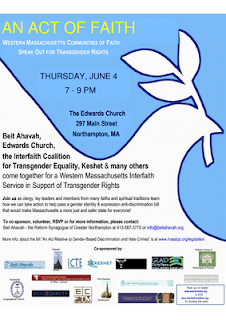 Tonight, Beit Ahavah (The Reform Synagogue of Greater Northampton), The Edwards Church (United Church of Christ), ICTE, Keshet and many co-sponsors held the event “AN ACT OF FAITH: Western Massachusetts Communities of Faith Speak Out for Transgender Rights” at The Edwards Church in Northampton. Ten congregations, eleven organizations, fourteen speakers (half of them transgender) and a full house of attendees came together for an incredible service to celebrate transgender people and commit to working for transgender rights. These are the first and second interfaith transgender events in Massachusetts history! I wish I could tell you everything that they mean to me as a transgender person and leader of faith. What they mean to everyone who attended and everyone else who was part of them. They are miraculous, powerful, wonderful, beautiful beyond description. They are truly transformative. With their program, each attendee was given the Massachusetts Transgender Political Coalition’s (MTPC) information about the bill and how to support it, ICTE’s signed Declaration of Religious & Faith-Based Support for the bill, information about the Transgender Emergency Fund, a green commitment card with several actions for the bill and transgender social justice, and wildflower seeds. The first part of the service was a Welcome. Rev. Dr. Peter Kakos (Pastor, Edwards Church) gave an Invocation, and Rabbi Riqi Kosovske (Rabbi of Beit Ahavah) a Welcome. Gunner Scott (Director, Massachusetts Transgender Political Coalition) spoke about Testimony. Rev. Dr. Andrea Ayvazian (Pastor, Haydenville Congregational Church) sang Libby Roderick’s “How Could Anyone Ever Tell You”. The second part was Tilling The Soil. I preached about the meaning of Transfaith -- to read my sermon (Google Document), click this sentence. Rabbi David Dunn Bauer (Rabbi of the Jewish Community of Amherst) spoke On Chaos And Order and co-led Holly Near’s song “We Are A Gentle Angry People”. My fellow ICTE Co-Chair, Rev. Dr. Cameron Partridge (Priest, St. Luke’s & St. Margaret’s Episcopal Church; Founding Member, TransEpiscopal) spoke about Giving Voice To Remembrance – for his blog entry, including his speech, click here. Tynan Power (Regional Coordinator, Al-Fatiha), read from the Qur’an -- Surah al-Inshirah (The Expansion). The third part was Planting Seeds. Minister Louis Mitchell (Deacon, South Congregational Church; Minister, Recovering The Promise Ministries) gave words and an original prayer. Jan Alicia Netter (President, Unitarian Society of Northampton & Florence) spoke about the Circle Of Caring and read Rev. Richard Gilbert’s poem. 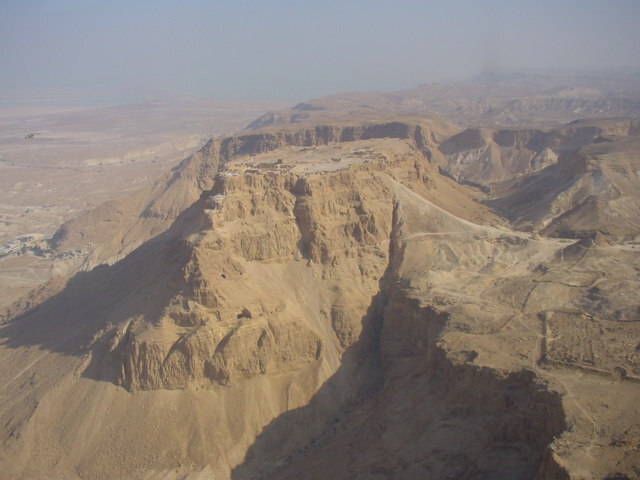 Rabbi Kosovske (Beit Ahavah) spoke of the Seeds Of Tradition. The fourth part was Watering. Yohah Ralph, MDiv (Community Minister; Graduate, Episcopal Divinity School; In Care in the United Church of Christ; Member, First Churches Northampton) gave a Reflection On Faith. Arinna Weisman (Founding Teacher, Insight Mediation Center of Pioneer Valley) spoke and led us in Meditation & Movement. The fifth and last part was a Closing. Rabbi Justin David (Rabbi of Congregation B’nai Israel) gave a Call To Action. Jennifer Levi (Director, GLAD Transgender Rights Project) spoke of our Next Steps. Rev. Kakos and Rabbi Kosovske gathered all the speakers to give the Benediction. We speakers processed down the aisle and formed a receiving line behind the pews for the attendees. During that time and the reception that followed, I met many of my fellow speakers for the first time, and was gifted with several people’s responses to my sermon and the rest of the service. How much more so with personal stories about their lives from each of the transpeople, loved ones and other allies I spoke with. A transman about to come out and begin his transition, who shares my fascination with mixed gender identity and expression. A transman who was partly sustained in high school by looking at my photograph in The Shared Heart (a book, exhibit and curriculum of GLBT youth portraits and essays – I’m the only transperson) every day. A transwoman who came out when she was eight, and went to a GLBT high school. A transwoman who shares my love of creating and wearing jewelry – and possible need for Jewelry Anonymous! A transwoman whose circus work taught her how to unite groups of people through the spirituality of their bodies and the rest of the natural world. A transwoman who like me comes from an interfaith family and has felt unwelcome, but sees and hopes for change. A transman who shares my interest in how faiths can learn from each other’s greatest teachers, including Jesus. I am so blessed, grateful and proud to be part of tonight’s service, and the work which led to and will follow from it! Massachusetts has always been my beloved home (I was born and have always lived here). I’ve always felt closer to the Western part of the state than most greater Bostonians, yet I haven’t had nearly enough interaction with that community. This evening and its process was a rare and precious window and door into the amazing transgender and allied community of Western Massachusetts. What a privilege to witness such a thing, never mind be so welcomed and included! Hinei ma tov, how good it is to see the parts of my state uniting for transgender social justice and becoming more (of a) whole in the process. Transpeople and our loved ones have been and are hurt, in faith communities and the rest of the world. We and our allies have much work and a long journey ahead of us, towards our inclusion in communities of faith and social justice. Tonight’s service acknowledged all of that, and yet was also so healing and hopeful. Tonight is part of a movement that will transform this state and country and beyond. For the flyer (PDF), click here. For the program (PDF), click here for the outside and here for the inside. For my photos (Picasa Web album), click here. The event was also photographed and filmed. For the Edge Boston article, "Bay State religious groups back transgender rights bill" (by Joe Siegel, New England Editor), click here. For more press coverage, you’ll soon be able to click here. Thank you to the event committee – Rev. Andrea Ayvazian, Rev. Eric Fistler (Minister of Christian Education, Edwards Church), Orly Jacobovits (Senior Organizer & Community Educator, Keshet), Rabbi Riqi Kosovske, Jennifer Levi, Jan Alicia Nettler, Tynan Power, Gunner Scott, Marcus Simon (Office Manager, Beit Ahavah), Marsha & Bill Zimmer (latter is President of Beit Ahavah). I must especially kvell (be proud) about Marcus because he’s also a “TWiG”, a member of Keshet’s Transgender Working Group. And I must especially thank Tynan because he coordinated press coverage, and his family photographed, filmed, and co-led a song. Also, special thanks to Cameron for schlepping Orly and I from and to Boston. Thank you to our cosponsors, speakers, volunteers, attendees and everyone else who was part of this event!